This week has felt kind of crazy. I’m used to working from home three days a week. This week, I was in the office every day to help with some training. When you add up the one hour commute each way and the lunch hour I usually use to do housework, nine of my usual “doing stuff” hours have been chewed up. That’s like an extra day! Quite obviously, quick and easy has been the go-to for food this week. 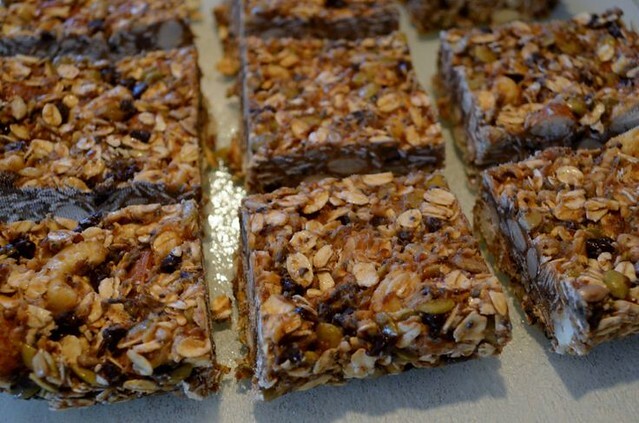 I mixed these bars up over the weekend and they’ve been a great go-to for breakfast or a post-gym snack. Loaded with nuts and seeds, they’re quite filling – and since they’re no-bake, they only take about five minutes to prepare. These can easily be made vegan – just use vegan chocolate chips – and gluten-free – just make sure you’re using gluten-free oats. Line an 8×8 pan with parchment. In a large bowl, stir together the oats, flax meal, chia seeds, sunflower seeds, pumpkin seeds, cashews, almonds and chocolate chips. Stir agave nectar in until evenly distributed. Stir in peanut butter until well combined throughout. Press mixture into prepared pan. Freeze for 1 hour, then remove from pan and cut into bars. Store in freezer until ready to eat.